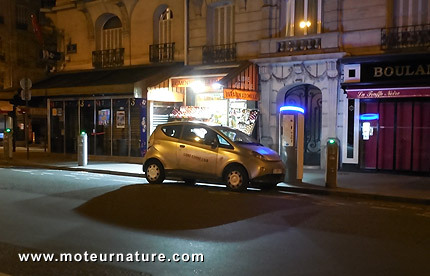 The Bolloré Bluecar got famous since it was chosen for the Autolib car sharing service in Paris, but it still has a lot to do when it comes to please private customers. This is a whole new market for the little French-Italian car, which has been available to private buyers for nearly a month, at a price of €19,000 ($15,568) battery not included (it needs a separate lease). But the Autolib service doesn’t help much. It sure shows that the cars drive, but they don’t look good. Most of the cars are only one year old, but they look much older. That didn’t scare a lady from Brittany who became last week the first private customer of a Bolloré Bluecar. She will have to pay €65 each month ($85), to rent the battery, forever, unlike the corporate customers who got their Bluecar on a fixed-term lease.